Replacement calibrated measuring cells can be purchased for easy change over on board the vessel and calibration verification kits enable the crew to demonstrate the monitor is within factory calibration to PSC Surveyors. 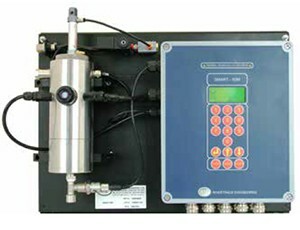 The system has the ability to record data from up to 3 Oily Water Separators (OWS). This data can be downloaded to a PC, printed or emailed using the built-in email application. 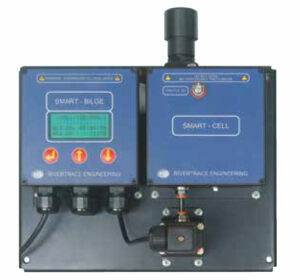 The Oil Discharge Monitoring Equipment (Smart ODME) has been designed to provide means of monitoring, recording and controlling the ballast discharge for crude oil, product and chemical tankers including ICE class vessels. This system is modular in construction and does not require the usual pump/motor bulkhead penetration as used on older systems. The Smart ODME includes all components required to meet MEPC 108(49) and the latest MEPC 240(65) for Bio Fuels, effective 1 January 2016. The Smart ODME incorporates a ‘simulation mode’ to aid system demonstration to PSC surveyors, is designed for ease of retrofitting, operation, installation and maintenance. Discharge limits are set at 30 litres of Oil per nautical mile or 1 / 30,000 of the previous cargo for dirty ballast. Check out all Certificates for this product. The “OCD Xtra” combines multiple light wavelengths with multiple sensor technology, to measure oil accurately in the range 0-200ppm, even in the blackest of produced water. Multiple oil types are automatically compensated for by sophisticated algorithms. The multi-parameter display shows the sample’s oil content, turbidity, pressure and a graphical average of the last 4 hours oil readings. The last 7 days readings are stored in ROM and can be accessed from the help menu. The OCD Xtra has the ability to adjust the calibration settings against laboratory analysis on site. Full on screen help is available to guide the operator during set-up and maintenance routines. A monitor designed to cater for the special conditions associated with high sample temperatures. 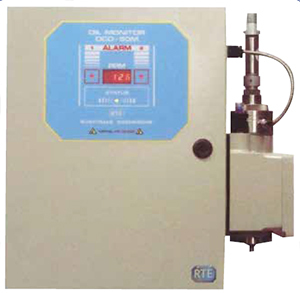 This unit will detect oil in much smaller quantities with great reliability and repeatability. Increased boiler protection from early detection of oil contamination. 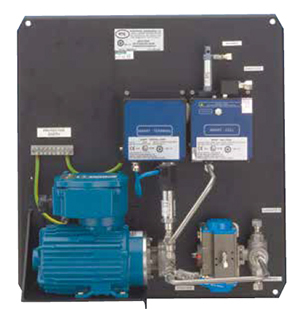 The OCD CW is a low cost solution for simple cooling water monitoring applications, designed for monitoring engine cooling water and fresh water systems. The system is widely used in refineries and power statins when discharging their cooling water to local rivers and the sea. Boiler condensate can also be monitored with the addition of a cooler. With solids discrimination up to 50ppm the OCD CW provides repeatable accurate monitoring and can also be used in industrial waste water applications. A versatile and sophisticated monitor to suit multiple applications in marine and industrial environments. 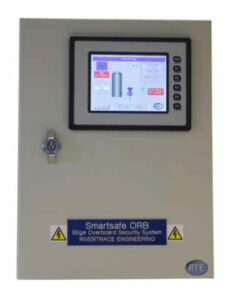 The Smart 50M uses a nephelometry based detection technique and uses sophisticated algorithms to detect Oil and suspended solids in the sample. The design of the measuring cell allows the monitoring of high temperature and high pressure samples across multiple ranges of Oil Concentration. Auto-Clean and Auto-Zeroing functionality ensures the maintenance is minimal and that the measuring cell is kept free from fouling. The Smart 50M can provide the Oil Concentration value to a DCS or PLC using a 4-20mA output and additional process variablescan also be provided using the Modbus digital communications protocol (over RS485). 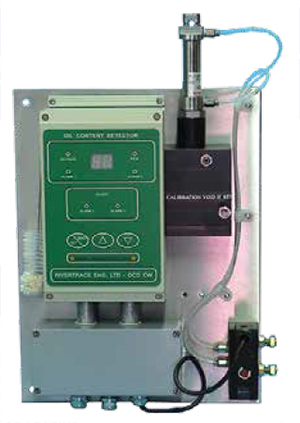 Conductivity, pH and Dissolved Oxygen can also be monitored by incorporating the Auxiliary Inputs Assembly. We are also able to build this as an “Exd” type system in a protective enclosure for Hazardous Environments. 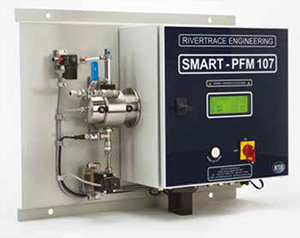 The monitor measures particulates in the sample stream on a continuous basis by passing the process fluid through a proprietary photo optical measuring cell developed by Rivertrace Technologies. Using a combination of optical recognition algorithms and light intensity it is possible to differentiate between Oil particles, Gas/Air Bubbles and Solid particulates in the range 0-500 microns. Flow and particulate characteristics can be visualised live via remote access and via optional dedicated software on any Windows PC. Oil concentration, pressure, temperature and oil alarm status are displayed on an easy to read back lit alpha numeric display. 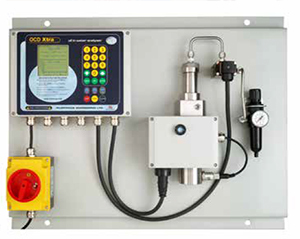 Oil concentrations, alarms and fault log are stored within the system to comply with the reporting requirements of IMO resolution MEPC 107(49) and can be accessed remotely or downloaded onto a pc via LAN or USB for further analysis. When connected to the internet it is possible for remote diagnostics to be performed by the manufacturer or an approved service centre. The Smart PFM offers a choice of auto cleaning methods to ensure the accuracy is maintained at all ties. Dependant of the utilities available you can choose from an air driven solenoid, electronic actuator or high power ultrasonic cleaning method. The cleaning is fully automatic and operates whenever it senses contamination of the optical windows. 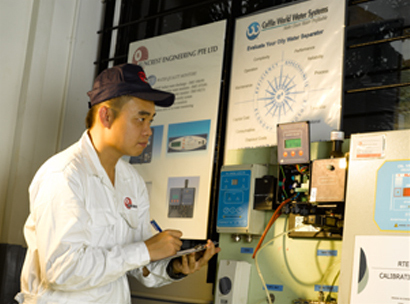 Specialised in solving Oil in water monitoring problems and we can make systems to meet your requirements. In-house calibrating facilities available and certified by OEM Rivertrace Engineering for calibrating and certification OCD-1M, OCD-2M and OCD-CM bilge alarm monitors. Verification fluids are available, call us for more information.